everything LEB: Where am I sitting? Tell me, what did you use at your wedding? Any creative ideas for me? awwwwe i really love a lot of these - i dunno what in the world i would pick! - never married - i can't commit to something like that (as of now) .. but i do know - and anyone who does know me - i'd need a good 2 years to plan mine - cuz it would have to be PERFECT and beyond extraordinary!!! - that's just how i do things - and seems like u too!! I like the "Lover's Lane" photo holder. So cute. is that an olive wreath? I like the idea!! I LOVE the block of wood! Like the wine bottle label. 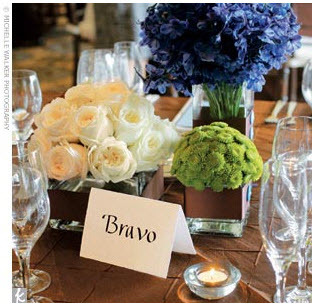 We did a different flower arrangement at each table. The flowers weren't exotic so everyone knew where to sit. It was very pretty, and I heard alot of positive feedback. 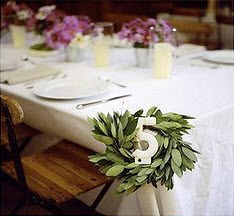 google images are being silly today, but our table numbers can be seen here. I DIY'd them and loved the way they came out. i would tend to agree with Cara above..have you decided on a theme? a venue? i haven't been married but i tend to like the idea of names/words/places etc. 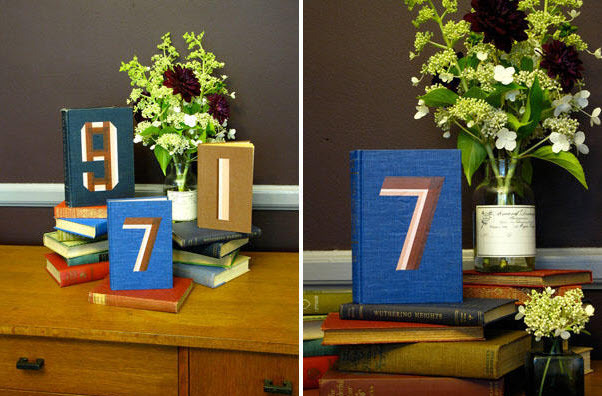 instead of numbers. i think with numbers too much people get hung up on (or wonder about) "why am i at table 11 and not 4..." (or maybe that's just me!) plus i think usig names/words/places allows you the opportunity to share more of your story (as a couple) with your guests. 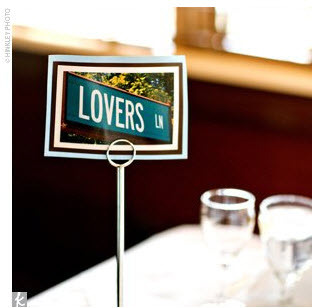 for example if each table was named after a city you've visited while you've been together that would be a cute way for guests to learn more about your passion (travel) and where you've been together. my two cents! i'm sure whatever you decide will be lovely. LOVE the wine bottle + street sign ideas! keep pushing through, it's totally worth the stress! good luck + have fun! We used table numbers, but instead of just posting the number, we put a picture of each of us at the age of the table number & then superimposed the number on the photo. So for 1, there was a pic of each of us at age 1 with the large 1 over them. They took a little time to make, but our guests were really taken with them! 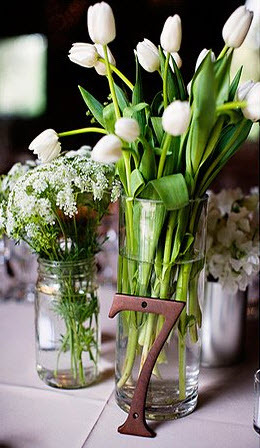 I love the fourth one and I love the metal number leaning against the flower arrangement. 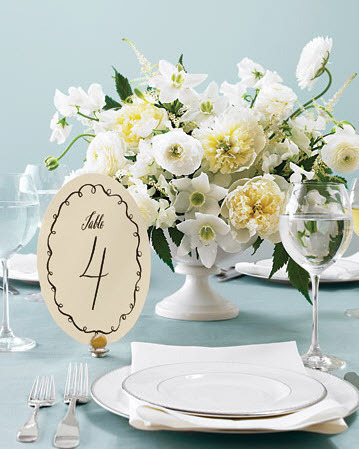 I just went to a wedding where they had large iron numbers on each table next to fabulous flower arrangements. 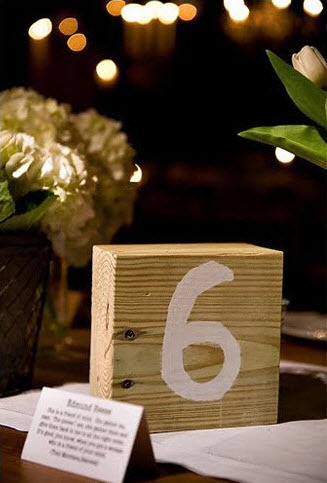 Upon entering the room there was a ginormous picture frame with the table numbers and guest's names for those tables! It was fabulous and everything was so elegant! I just love all of these ideas! Love the wine bottle labels! We actually didn't do table numbers though because we just did a buffet and let folks sit down anywhere. Definitely simplified things. A cute idea my friend did though: she had an outdoor reception and had potted plants with the table number painted on the pots -- they doubled as center pieces and table tents! She also included a framed photo from her engagement and bridal shoots at each table, which I thought was a lovely and personal touch. These are all great options... there are seriously endless options when it comes to wedding choices (or at least that is the way I felt). 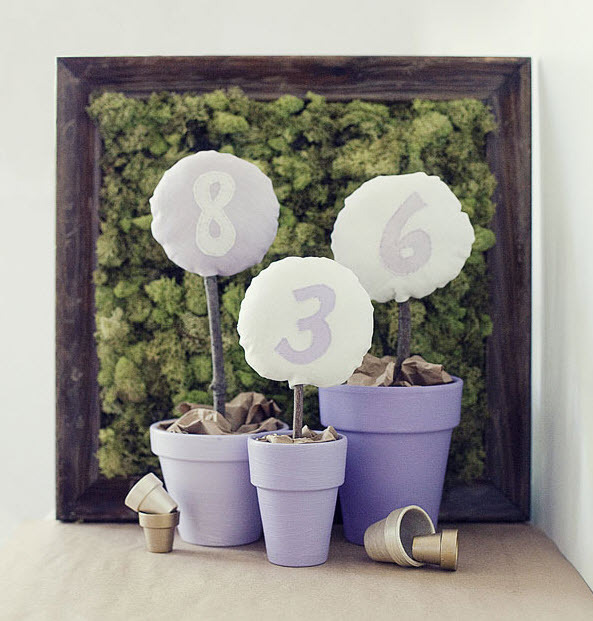 We ended up attaching table numbers purchased at a craft store to vintage looking photos from our travels. Here is a link to the tutorial and if you want to see an image of the final result just drop me a line and I"ll dig up the link. Good luck!! A friend of mine did "Street names" for her table designations. Each street usually pertained to how she knew the guests at her table (e.g., she knows me from living at the beach together one summer, we lived on 75th street, so my table, full of people form that summer was the 75th street table). I thought it was really cute and personable! Looks like your on the right track with ideas. wow...so many great ones. I love that lovers lane photo.. 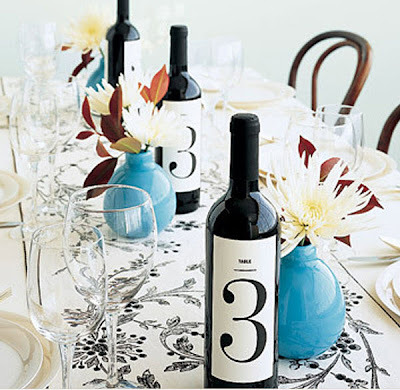 I like the numbers on the wine bottles! love the wine numbers but also like the book idea than people can casually leave a note during dinner! those are all super cute!! hope your wedding planning is going great! 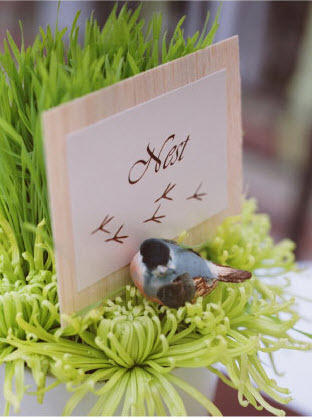 when we got married last year I used the oval martha template (4th image) printed in pale green and places in little ceramic pots that I filled with spanish moss (wedding was in the coastal town of Wilmington, NC). I thought they looked beautiful, were very easy (and cheap!). 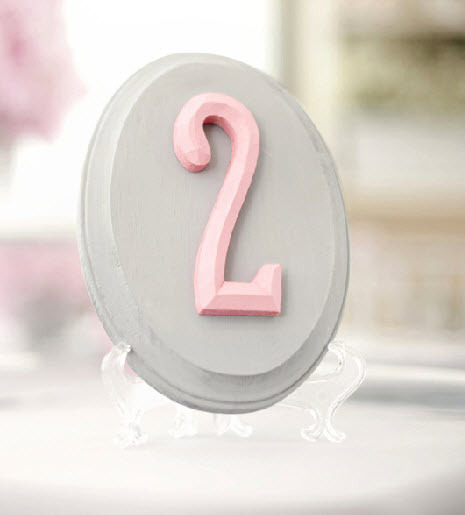 I kept the "1" since that was our table and since it's flat it could go into an album! happy wedding planning! I am glad ours is over and we're just married, but it was SO MUCH FUN to plan! I second Janell - LOVE the wine bottles with the numbers on the labels. Classy all the way. Never seen that at a wedding before! My husband and I got married in NJ, so we took pictures of Exit signs from the Parkway and Turnpike and used them as our table numbers. It turned out pretty funny! I think that numbers or photo prints like the ones that your posted are so much more contemporary than name cards. I would agree with a previous post that you can manifest any of these concepts to fit your theme. Lovely images for the week. Thanks for sharing. I Just love everything wedding! For our wedding we took photos of famous/historical places in Chicago (the city we were married/live in) and changed them to sepia and then matted them on bronze paper added the names of the places onto them and used them as our table names (versus table numbers). I was at an hollywood-themed wedding in LA where guests sat at "The Princess Bride" table, "The Bride of Frankenstein" table, "The Runaway Bride" table, etc. You looked for the movie poster to find your spot. Well, okay, there were ushers. Just stumbled on your blog, but wanted to say that my husband and I made the wine bottle labels and they were super easy. We just bought shipping labels and printed on a regular printer. Only took a few hours total to remove the wine bottle labels, print our own, and assemble! They were one of my fav little details :) How does Martha do it?